Do we need to floss? The truth, from the experts. Dental floss is a thread or ribbon usually made from Nylon or Polytetrafluoroethylene (Yeah, I can’t pronounce that either) and is commonly branded as Teflon. Dental floss can be biodegradable, waxed or non-waxed, and is available in a range of flavours. Meaning, there’s a dental floss out there for everyone… The purpose of floss is to help clean around your teeth, as well as below the gum line, removing food and harmful bacteria from your mouth. We have all been told to brush and floss regularly but many of us don’t. Now, there are some clinical experts that are going as far to say that flossing is pointless. Is it true? We take a look at why experts are debating whether flossing is beneficial. We tell you the truth about to floss or not to floss, with some helpful tips and advice from the dental experts at the Brighton Implant Clinic. Let’s start with the facts – food and bacteria, which is not cleaned properly from teeth, will lead to plaque, tartar, and oral diseases. This is backed up by research, science and clinical studies. Brushing alone cleans the front and back surfaces of your teeth, however, it is not enough to reach under the gum line and surfaces in-between teeth. This is why floss was created to clean the food and bacteria in-between your teeth and under the gumline. The debate – Brushing has been clinically proven to clean and remove food and bacteria from teeth but the benefits of flossing in terms of research are still pretty weak. Some clinical experts are going as far to say that flossing is pointless! And they’re right…if you’re not flossing correctly. The majority of us are not flossing correctly. This is perhaps why the benefits of flossing are still divided, especially when some of us are in actual fact damaging our gums through flossing incorrectly, OPS. 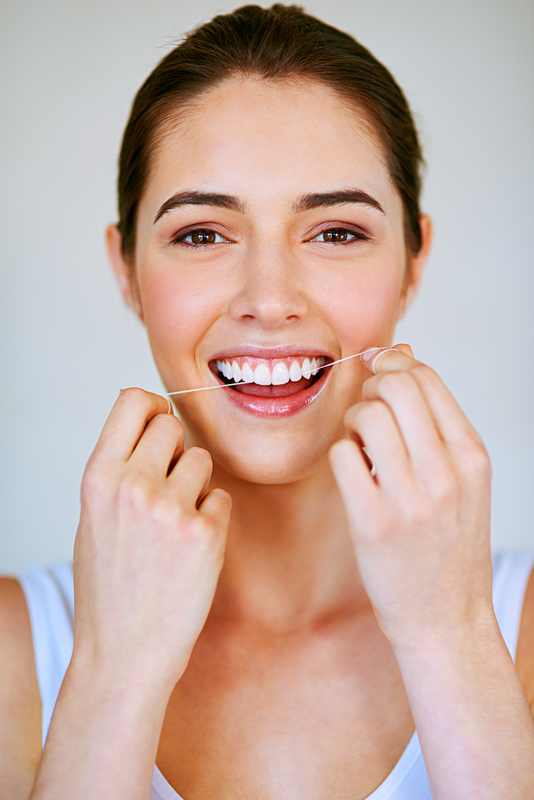 Dr Bruno Silva, clinical director and principal dentist at the Brighton Implant Clinic advises that “flossing is one of the most important regimes to maintaining good oral health if done correctly. It can successfully reduce, as well as prevent plaque and tartar build-up, where bad bacteria manifests. An interview with Dr Bruno Silva, find out more. GETTING IT RIGHT – THE MOST IMPORTANT BIT. There are many different types of dental floss and it is important to find the right one for you. Floss can be waxed/unwaxed, flavoured/unflavored, ribbon or tape. Commonly, waxed floss is considered easier to slide between the teeth however, your decision should be based on personal preference. Make flossing a part of your everyday routine. Floss one tooth at a time. If you have dental implants it is still very important to floss daily around your teeth and gum line. Dental implants must be cared for as if they were your own teeth, in doing so, this will ensure that your dental implants will last. There are different types of dental implant treatments, therefore caring for dental implants is dependable on the fixture you have. For single dental implants, we recommend Tepe Bridge and Implant Floss, with the flossing tips above! With a full upper or lower arch restoration using dental implants, it is advised that you use interdental brushes and an electric flosser also known as a Water Pik. For more information on dental implant treatments or care, visit The Brighton Implant Clinic . Super floss is a kind of floss that is specifically designed for braces, bridges, and small to wide spaces! Use this with your braces, bridges and implants to reach difficult areas, available over the counter.